I’m back on track on my blog again; so here’s another review! The end of 2016 is coming to a near and I need to cram in some 2016 anime before the year ends. I just finished watching Orange so I thought I might as well review it since the events in the anime are still fresh in my head. Overview of Orange is quite gimmicky to the regular shoujo, though there’s a small twist that seems nonconventional to your typical shoujo anime. I’ve heard raving reviews for the manga yet after watching the anime I feel a bit underwhelmed- but not disappointed at the same time. 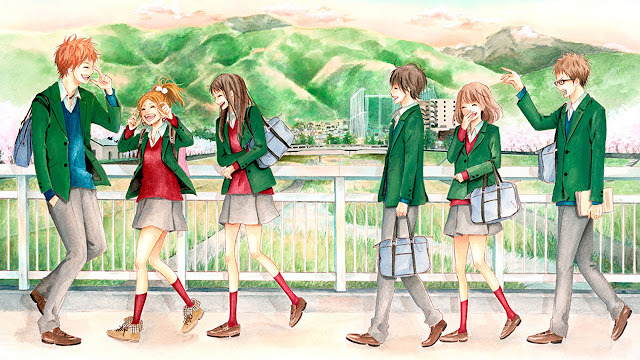 Orange follows a group of high school students, Hiroto Suwa, Kakeru Naruse, Naho Takamiya, Saku Hagita, Takako Chino and Azusa Murasaka, doing what high schoolers do… The anime is a shoujo so there aren’t many surprises to the plot. So expect the usual love triangle, the love rivals, etc… I guess the wrench that’s thrown into the story that makes Orange different is that it’s known by Naho when the death of Kakeru will occur- and the date is right around the corner. Naho Takamiya receives letters from her future self from another world line that outlines methods to save Kakeru from his demise. It’s an interesting story in my opinion, it sort of reminds me of a boring mix between Steins;Gate and a lackluster shoujo like Bokura Ga Ita. It’s nothing close to Steins;Gate, but the concept of world lines that were presented in Orange reminded me of the anime. But after watching Orange, my feelings on the anime are a bit… meh. It was a weak shoujo, the characters lacked personality and there was nothing that interesting that kept my attention or drove me to immediately finish the anime. Although the anime was somewhat disappointing, I assume, to most fans of the manga- it also disappointed those who did not read the manga… or to me at least. I think besides the fact of how the anime version of Orange played out was a bit underwhelming; the explanation as to how the future version of these characters sent these letters of advice/recommendations to their teenage-selves from another world line was just… so bad. If you’ve seen the anime then you’d know what I’m talking about. I rolled my eyes when I heard the three-minute explanation as to how these letters were sent to the past. Overall Orange is an okay anime. It’s not horrible yet it’s also not bad at the same time. The anime is nothing special IMO, but if you want an okay shoujo you can try Orange. But anyways, thanks for reading my thoughts on Orange if you made it this far… I appreciate it! If you could leave a comment below that would be great!